Best-in-class acceleration, 0-60mph in less than 4.2 seconds! Best-in-class top speed, 65+ mph! The TRX® 3.3 Racing Engine provides extreme power, brutal speed, and furious wheelie action. Resonator™ blue-anodized aluminum tuned pipe is engineered with precision to enhance the performance of the TRX 3.3 Racing Engine. Front & rear sway bars provide superior handling and stability. Super-sticky 2.8-inch Anaconda™ performance tires deliver asphalt-hugging street traction. So fast, that the included wheelie bar is mandatory. Incredible body graphics match the performance and speed of Jato 3.3. Best in class suspension travel, 12mm more than other 2WD racing trucks! Adjustable internal two-speed allows unmatched acceleration and top speed without compromise. Sealed gearbox protects the two-speed and other sensitive transmission components from dirt and rocks. Sealed, limited-slip gear differential is fully tunable with standard silicone differential oils. Ball differentials simply can't compete for tunability, efficiency and reliability. Our engineers went to extreme lengths to develop the unique bellcrank steering system geometry that completely eliminates bump steer. An integrated servo saver protects the steering servo. Revo®-style Torque-Control™ slipper clutch uses semi-metallic pads and heat-dissipating finned aluminum alloy pressure plates for smooth linear engagement and consistent traction control. The semi-metallic brake disk provides smooth stopping power and virtually eliminates fade caused by heat build-up. 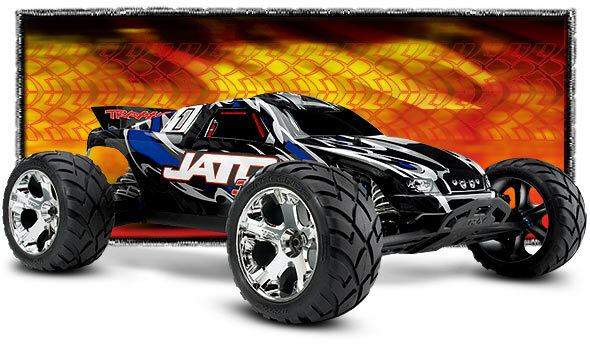 The Traxxas EZ-Start® incorporates our latest revision of component and design technology to assure the most reliable operation. It is the only starting system to provide true, one-handed push-button engine starting. On-board diagnostics instantly troubleshoot any potential starting problems. EZ-Start is the safest and easiest starting system available. The low-profile 75cc fuel tank is mounted in the center of the chassis to promote superior chassis balance and handling dynamics. The TRX 3.3 Racing Engine is mounted in the middle of the chassis allowing near perfect side-to-side weight distribution. Double-shear connections are used on critical suspension linkage to prevent separation in a collision. True constant-velocity U-joint driveshafts use rubber seals to maintain smooth, trouble-free performance. These operate at the most extreme deflection angles and allow for the most suspension travel. Optional metal constant velocity driveshafts are available that reduce rotating mass for racing conditions. Tough, 3mm thick 6061 aluminum chassis plate is fully countersunk on the bottom, including the engine mounting screws. Removable roll hoop helps protect critical chassis components and serves as a convenient carry handle. Precision GTR™ (Revo®-style) shocks with composite bodies provide smooth, consistent damping performance. Threaded shock bodies allow precise ride height adjustment. 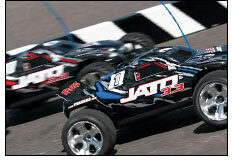 Integrated "buggy style" dirt guards join with the body to form a tightly sealed barrier against dirt and rocks. Enclosed radio box protects sensitive electronics from dirt and fuel spills. 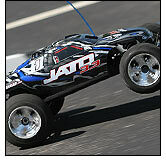 Jato's exclusive 2-position receiver battery mounting (mid and rear) provides additional tuning options. Precision metric hex hardware is used throughout.